The principle owners of Marine Auction Exchange LLC (MarEx) have successfully conducted auction sales of close to $400 million dollars of real estate and marine equipment. Efficiently produced auctions are the perfect marketing system. The auction process has existed throughout history. The stock market, the mercantile exchange, eBay are all auction markets. It is a sales tool that accelerates the sale process. Many times property offered for sale will sell before the auction is held. Several current auction inventory vessels have been sold and action is taking place on others. All consignment property is sold subject to prior sale. 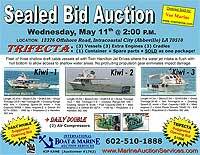 The sale will feature a variety of marine vessels and equipment. Click here to view the auction inventory. The auction will be carried live via Internet Streaming Video, so that you can view the auction and bid either on site or by internet. Online bidders must pre-register, click here for On-line Bidding information.